I acquired this recently from a friend of mine. The story is that his current wife (number 2 and hopefully last!) inherited this watch from her Father's estate upon his passing a few years ago. It was given to the then young man when he enlisted in the RCAF (Royal Canadian Air Force) in April 1944 by his parents. It is so inscribed with his name, date, RCAF number with love from "Mum and Dad". My friend is a bit of a WIS, had a Rolex Air King Date (since stolen sadly) and now wears a Breitling. He knows I'm much more into the hobby so he showed it to me. I was impressed with the obvious originality and completeness of the package, but for the Bulova branded expansion band that is probably from the 50's but complements the watch nicely. It too looks like it's been attached to the watch a very long time. Sadly, nobody in the family wants the watch, even so the obvious sentimental connection. They felt that somebody who really appreciates vintage watches should own this rather than be left sitting in a drawer as it has been for a very long time. Hence, it's now mine. On starting it up, the original "Oyster Patent" crown sets and winds and screws down properly. After a few weeks of use, the watch tends to gain a couple of minutes a day. More so being worn thus in a variety of positions, less if sitting on its side, crown up using the old self regulation tricks here. While the paperwork isn't filled out, it's clear to me this is just as the owner received it in 1944. I'm amazed that the papers and box were retained and are in such decent condition. The dial and hands show obvious aging but no signs of repair. The crystal has some crazing and isn't crystal clear like a new one. Wouldn't be surprised if it is also original. Some minor marks on the casing but otherwise is I think an outstanding example of a watch that is 70 years old. SN starts 229xxx marked on the exterior of the caseback, not between the lugs. I haven't taken to my watchmaker to open it up to check model number but believe likely 4220 based on what I've read. Movement should be a 15 rubis Rolex movement. Can anyone confirm these details without need to remove the back? 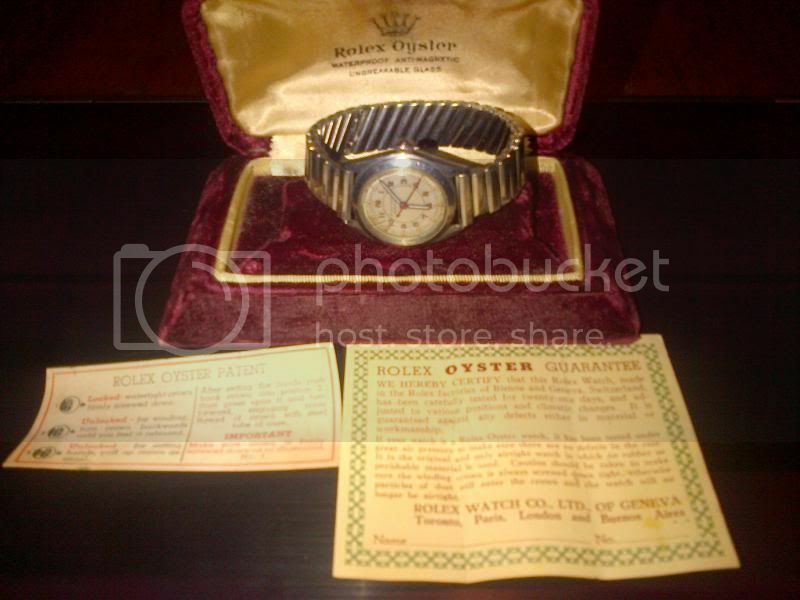 Note this is signed "Rolex Oyster Royalite" and "Swiss Made" but does not bear the Rolex crown. It may well inside the caseback but not on the exterior. Also interested in knowing what the factory band or bracelet would have been? If a leather band, would the buckle have had any Rolex markings or generic steel? 17mm lug width, would buckle have been 16mm or 14mm? I'd appreciate any comments or knowledge that you wish to share. "Too many watches, not enough time!" Rolex Oysterdate 6694, Jungfrau 18K dress watch and my Dad's 25 year company award Omega Deville.